The 13 lessons of this study guide help Christians develop an informed faith about supernatural evil and the gospel of Jesus Christ. Each lesson refers the reader to significant teachings in Silencing Satan: Handbook of Biblical Demonology. In the book, the authors teach about the nature and strategies of Satan and the demons, and their defeat through the life, death, and resurrection of Jesus Christ. They advocate resisting the devil in his various guises--apparitions, voices, sensations, false doctrine, and immoral temptations--by reflexively turning to Jesus Christ and Scripture. The authors expose the half-truths and lies propagated by popular culture. They caution not to fill in gaps of understanding with extra-biblical sources.Does the study of Satan and the demons increase fear or give him too much attention? In fact, when presented from a biblical perspective, such knowledge can increase faith in Jesus Christ and enable Christians to effectively serve God and his church. Believers are challenged to live a radical life of faith, expressed through love and obedience to Christ. Seminarians, pastors, Bible teachers, Christian counselors, and lay leaders will find this study useful in individual and small group situations. A leaders' guide is available in the appendix. 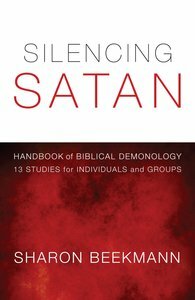 About "Silencing Satan: Handbook of Biblical Demonology"
Sharon Beekmann is an ordained minister in the Evangelical Presbyterian Church. She is author of Enticed by the Light. She preaches, teaches, and conducts seminars for churches through Sharon Beekmann Ministries.